Texas Tommy is from DC? With a full weekend of sightseeing under our belt and some bowling as well, Sunday brunch was upon us and we wanted to try a local joint in Alexandria, VA close to the hotel. Table Talk was where my Urbanspoon Android app suggested, and at just 4 blocks away, we were game for it. A little while ago, we were watching TV and found a special on diners. Table Talk happened to also offer a dish that was from the show. (On the show, it was a dish from PA). Anyway, I felt adventurous and went for THE TEXAS TOMMY (View another description here). 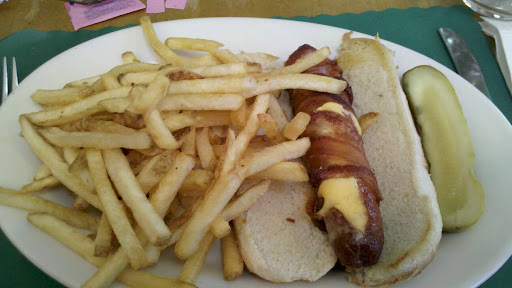 It is a hot dog stuffed with cheese and wrapped in bacon. (Bye bye diet). The combination was interesting. I believe it was deep fried, which left the hot dog kid of tasteless. Overall, I’m glad I tried it, but not going to go out of my way to do it again. The fries that came with it were basically poorly made McDonald’s fries, so they didn’t win me over either.